Mary Kate is actually demonstrating two topics from the list here. She’s plinking with a 1950’s era Hakim 8mm Egyptian battle rifle. Who says history can’t be fun? Barbara is more of a hunter than I am. 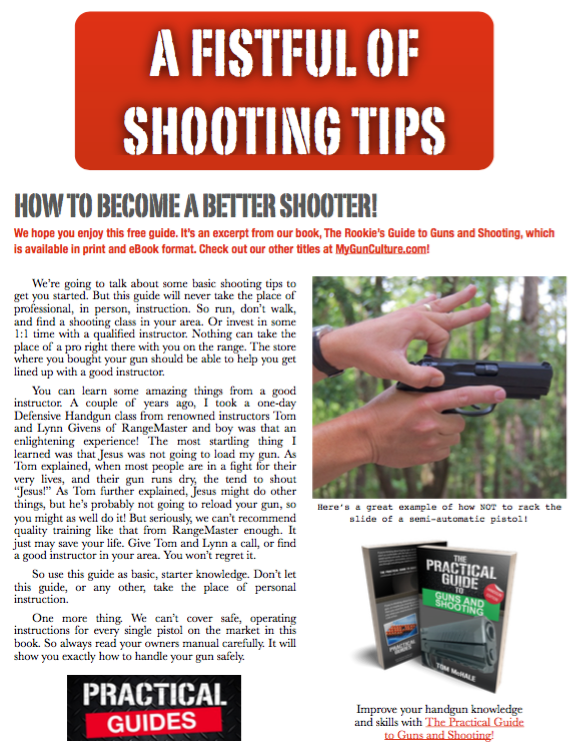 In this issue of First Shots News, she’ll tell you how to get started. While I hunt a little bit, mostly ducks and geese, she’s hard-core and chases down ill-tempered wild boars with flint knives. That’s what I’ve heard, and I’m sticking by that story. My interest in guns and shooting are primarily a result of… guns and shooting. While I enjoy hunting, my primary interest is shooting just for the sake of shooting. Rifles, perhaps even more than pistols, can have incredible stories to tell. When I first became interested in shooting, my first through tenth gun purchases were old battle rifles. To be more specific, I made a field trip to the Civilian Marksmanship Program sales center in Camp Perry Ohio to handpick some history. If you’re not aware of the CMP, check out their website. It’s a government chartered (not government operated) organization founded as part of the 1903 War Appropriations Act. the idea was to help the militia, that’s all of us, become proficient and safe markspeople. As part of the charter, the CMP sells surplus rifles and ammunition. They sold me a Springfield Armory 1903 A3 bolt action rifle and an M1 Garand manufactured in January of 1945. Every time I shoot those rifles, I wonder where they’ve been. Did they make an ocean crossing to Europe or the Pacific islands? Or were they used for training and coastal defense here at home? I’ll never know, but will always wonder. Walk through any gun show and you’re bound to find hundreds of guns with stories. Old West? World Wars? The first shooting competitions? You never know. Whether you plan to shoot an old rifle with a story or not, it’s a fantastic way to hold a tangible piece of history. Contrary to popular assumption, rifles can be a great home defense option, provided you choose the right platform. Unless you live somewhere like Encampment, Wyoming, you need to worry about over penetration. Consequently, using your .30-06 hunting rifle for home defense is not necessarily a great idea, as projectiles can travel through walls, houses, trees, cars and who knows what else. Here’s where the right platform choice comes into play. Did you know that (generally speaking) a projectile from a Modern Sporting Rifle will penetrate walls less than a standard pistol round? Regular 55 grain .223 Remington bullets are light, and fly very fast, so they tend to tumble and break apart when they hit solid objects like drywall, furniture and especially exterior walls. So, counter to assumption, a rifle can offer less risk of unwanted penetration. Additionally, rifles are easier to shoot accurately under stress. First of all, you support a rifle with two hands. Second, the sight radius, or distance between sights, is longer. Small movements in the sight picture do not translate into big misses as can be the case with a handgun. Last, rifles offer near infinite customization capability. Lights, lasers, grips and slings can all be added and tweaked to your exact preference. Read the rest in the NSSF First Shots Newsletter! Great article! I have a Weatherby Vanguard 270 which I love to shoot. I’m relatively new to shooting and the 270 has a bigger recoil than I’m used to, but nothing I can’t handle. I enjoy shooting it! Now I’m saving up for a 10/22!